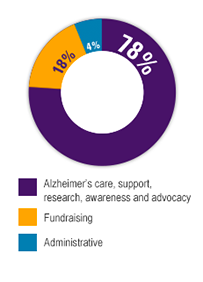 Every dollar you raise benefits those affected by Alzheimer’s disease in your community. Provides care and support to all those facing Alzheimer’s. Online message boards through AlzConnected®. In-person support groups, connecting those facing the disease with a network of help in their community. A free nationwide 24/7 Helpline (800.272.3900) offering information and referrals. Drives research toward treatment, prevention and, ultimately, a cure. Provides more than $440 million to over 2,900 scientific proposals, creating critical advancements. Brings the global research community together to tackle common challenges, such as the first new diagnostic guidelines for Alzheimer’s in 27 years. Drives support for transformational projects such as the Dominantly Inherited Alzheimer’s Network Trials Unit (DIAN TU). Speaks up for the needs and rights of people affected by Alzheimer’s. Helps to pass landmark legislation such as the National Alzheimer's Project Act, which mandated a national plan to fight Alzheimer's. Works to ensure federal policy reflects the urgency of the Alzheimer's crisis, resulting in unprecedented funding increases, including a historic $425 million increase. Recruits and trains hundreds of thousands of advocates to ensure that Alzheimer's disease cannot be ignored. The Alzheimer’s Association exceeds the rigorous standards of America’s most experienced charity evaluator, the Better Business Bureau Wise Giving Alliance. The Association also holds a National Charity Seal from the Alliance.